McDonald's Australia revamps their fry game with the introduction of new Loaded Fries, which come in two topping variations: Guacamole & Salsa and Bacon & Cheese Sauce. 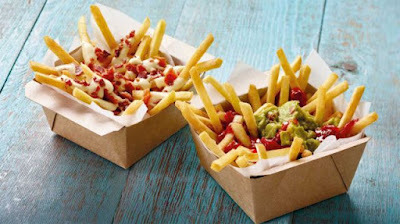 The bacon and cheese version is pretty standard fare when it comes to topped French fries (bested only by the tried-and-true combo of chili and cheese), but adding guacamole and salsa to fries is definitely an interesting move. It makes me think of carne asada fries, which can be found all over here in Southern California. The Loaded Fries come in either single or share packs and are available nationwide in Australia.